Popular anger is mounting continuously among the workers and students. It is starting to appear among the peasants. Everywhere it has the same grounds: the rejection of a capitalist and centralised society, the challenge to the autocratic powers of the government, of the employers and of the big farm owners. 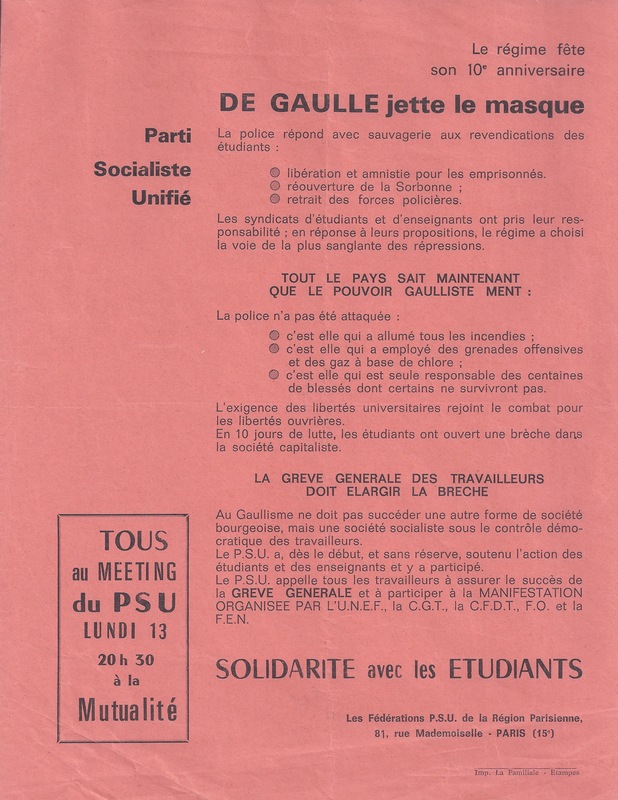 – The students must organise their power in the schools, the faculties and in the grandes écoles. – The workers must impose their power and that of the trade-union organisations, creating the necessary conditions for exercising this power. – The peasants must construct collective organisations on a regional basis, and establish the conditions for the production and commercialisation of their products. All those who no longer accept submission to the laws of a reactionary state ought to take it upon themselves to manage their own affairs. They should set up Popular Action Committees: committees for students and teachers in the universities and schools, workers committees in companies, peasant committees in the countryside, local committees, neighbourhood committees, committees on the large estates, etc. 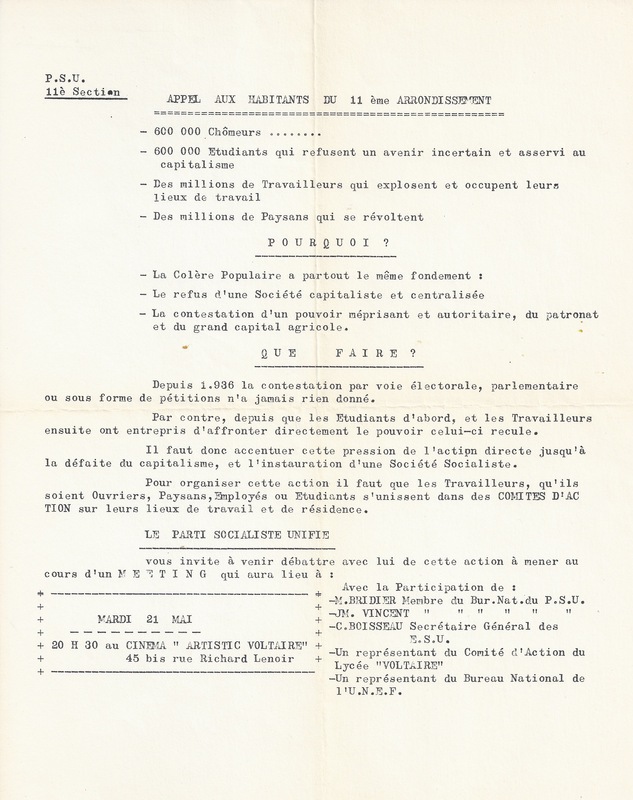 To all those who wish to confine the peoples movement or to limit its aims in order to control it better, to those who think they can answer the overall challenge to capitalist society by simply changing the parliamentary balance or a governmental formula, to those who are still hesitating because they did not believe in the student revolt and had doubts about the student-worker liaison during the struggle, we must in future respond by opening up new prospects for them. The right to veto decisions made by the bosses concerning employment and working conditions. Discussions of real wages and the length of working hours. Control of the utilisation of profits and investments. The right of civil servants to negotiate their pay and working conditions with their employer (the state). The creation of Company committees in administration and public establishments. Management of public companies by state and workers representatives. The increase of financial shares in national companies and the extension of the public sector by the nationalisation of centres of economic decision-making. Workers management of social security. The management of the organs of regional planning and production. Control of the methods of processing and selling agricultural products. The immediate establishment of real student power in the faculties, with the right to veto any decisions taken. Dependent on this first point is the autonomy of the universities and faculties. The transformation of ORTF into an autonomous public body, independent of the State and democratically controlled. Nationalisation of the press printing companies delivery services, advertising, by the creation of national boards managed by workers representatives, and by putting the technical information services at the disposal of the various trends of opinion. b) the takeover of other sectors of cultural life by writers and artists who have taken a stand against bourgeois culture. To fight underdevelopment and authoritarian centralisation. It is vital that the Popular Acton Committees co-ordinate their actions at a regional level. Instead of Gaullist government agents, regional authorities controlled by the people should be created, as embryos of assemblies capable of solving the problems of cultural and economic development (education, employment, industrialisation). — Millions of peasants who revolt. — Protesting a scornful and authoritarian government, of the bosses and the big agricultural capital. Since 1936 dispute through elections, the parliament or via petitions has never resulted in anything. In contrast, since first the Students, and then the workers have begun to directly confront the government it shrinks back. We must therefore increase the pressure of direct action until the defeat of capitalism, and the establishment of a Socialist Society. To organize this action requires that the Workers, whether they are Factory Workers, Peasants, Office Workers or Students, unite in ACTION COMMITTEES at their places of work and residence. – Mr. BRIDIER Member of P.S.U Nat. Off. -C. BALL Secretary General E.S.U. – freedom and an amnesty for those imprisoned. – retreat of the police force. 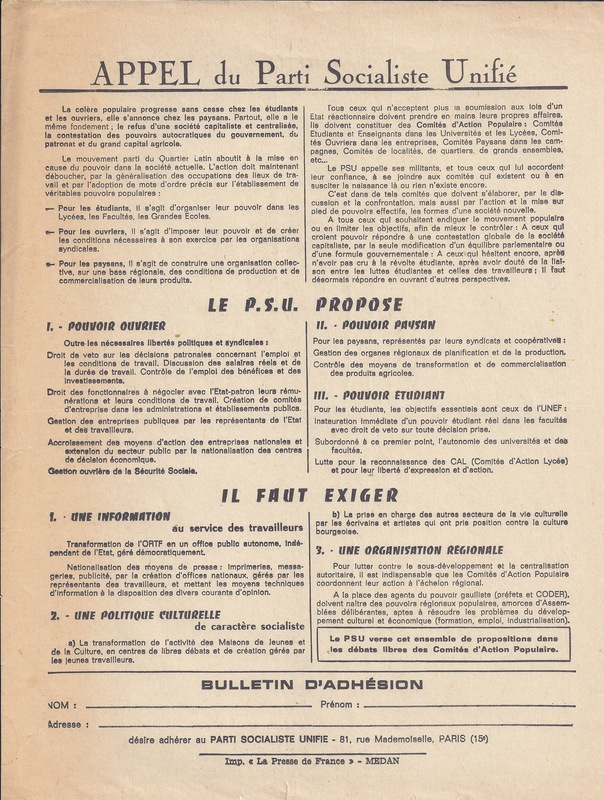 The students’ and teachers’ unions have accepted their responsibility: in reply to their proposals, the regime has chosen the most bloody repressive path. – it is the police alone who are responsible for the hundreds of wounded, some of whom will not survive. The demand for university freedoms meets with the combat for workers’ freedoms. In 10 days of fighting, the students have opened a breach in the capitalist society. 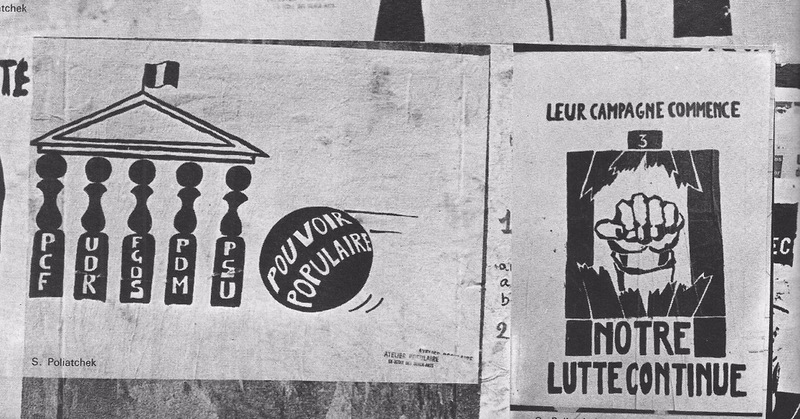 No other form of bourgeois society must succeed Gaullism, but a socialist society under the democratic control of the workers. The PSU has from the start unreservedly supported the students’ and teachers’ action, and has taken part in it. 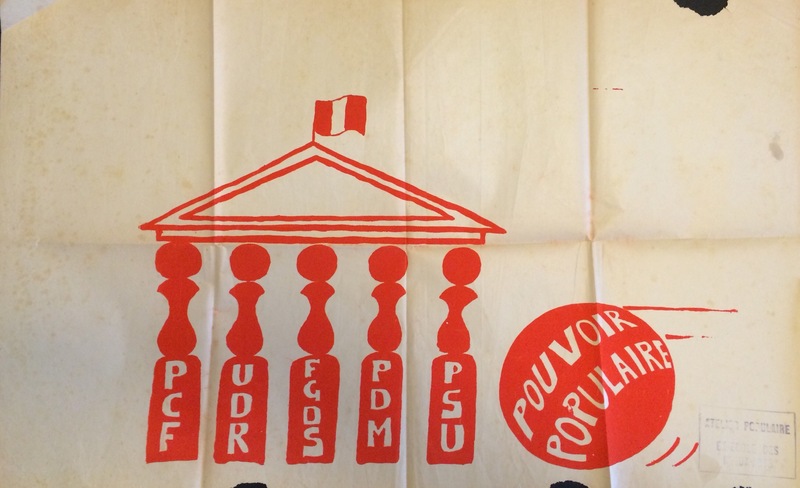 The PSU calls on all workers to ensure the success of the GENERAL STRIKE and to take part in the DEMONSTRATION ORGANISED BY the UNEF, the CGT, the CFDT and the FEN.